Since his first solo exhibition in 1973 Imants Tillers has been an influential proponent of conceptual painting. 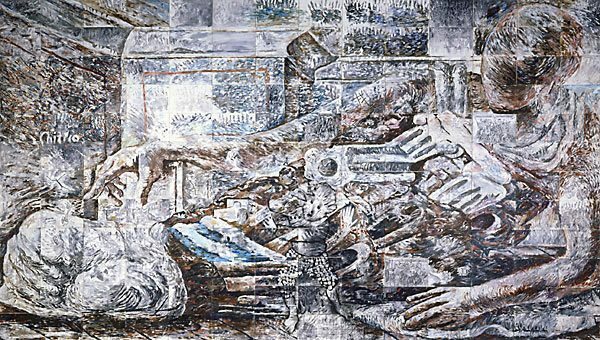 His investigations in the 1970s into seriality, visual displacement, found imagery, the original and the reproduction were precursors to his appropriation paintings of the 1980s and 90s. Since 1981 his canvas board system paintings have been individually numbered and constitute an ongoing body of work known as ‘The book of power’. ‘Pataphysical man’ was one of the key works in the exhibition ‘An Australian accent’, shown at PS1 in New York in 1984, in which Tillers exhibited alongside Mike Parr and Ken Unsworth. This exhibition attracted critical acclaim with ‘Pataphysical man’ being singled out as embodying contemporary appropriation strategies. In this painting the large figure is derived from Giorgio de Chirico’s ‘The archaeologists’ of 1926–27. De Chirico’s habit of recycling his own imagery and his style of classicism which stood outside more prevalent art developments fascinated Tillers. Other image sources within ‘Pataphysical man’ include Latvian children’s books and the handprints found in Aboriginal rock art. ‘Monaro’ 1998 (AGNSW collection) is the first major painting that Tillers completed after moving from Sydney to Cooma in the Monaro district of New South Wales in 1997. While it contains the range of appropriated imagery that characterises Tillers’ work, it was a response to a specific place in the light of his recent ‘Diaspora’ series, which explored themes of identity. The all-over field of soft grey tonalities, with subtle brown and pink tones, embodies a sense of the region’s eroded, treeless hills. Over this are painted the heads of cherubs, derived from an early 19th-century drawing by the German proto-romanticist Philipp Otto Runge, which surround an image of a mountain with its peak dissected by a painting stretcher, derived from the artist Sigmar Polke. The ‘T’ panels and numbers are cited from New Zealand artist Colin McCahon. To the right of the transparent canvas with the mountain is an image of St Peters, a church in Riga, the capital of Latvia, which was rebuilt after being destroyed in World War II. Tillers found the original image in Cooma, a coincidental connection between his new home and his parents’ origins as Latvian immigrants who came to Australia at the end of World War II. Robert Atkins, Newsday , 'on art/Australians arrive at P.S.1', 11 May 1984. Anthony Bond, 40 years: Kaldor Public Art Projects , 'An Australian Odyssey: connecting to international contemporary art', pg.25-29, Sydney, 2009, 26, 150, 152 (colour illus.). Anthony Bond, Art Gallery of New South Wales handbook , 'Contemporary', pg. 94-108, Sydney, 1988, 103, 104-105 (colour illus.). Anthony Bond and Victoria Lynn, AGNSW Collections , 'Contemporary Practice - Here, There, Everywhere ...', pg. 229-285, Sydney, 1994, 283 (colour illus.). Benjamin Forgey, The Washington Post , 'The edge of night: dark introspection from Australia', 22 Jul 1984. Bruce James, Art Gallery of New South Wales handbook , 'Australian Collection: Painting and Sculpture', pg. 102-181, Sydney, 1999, 174 (colour illus.). Kay Larson, New York Magazine , 'Seeing Australian', pg.88-89, 07 May 1984, 88-89, 88 (illus.). Kim Levin, Village voice , 'P.S.1's Report Card', New York, May 1984. Thomas McEvilley, Artforum , 'New York... An Australian Accent, PS1', Oct 1984. John Russell, The New York Times , '3 Vigorous artists from down under', 20 Apr 1984, C1, C21. John Russell, The New York Times , 'Art: the irony of Chirico', 27 Apr 1984. Alexandra Szczepaniak, Look , 'Judging Archie', Melbourne, May 2001, 38 (colour illus.). Imants Tillers, Art & Text (No.15) , 'In perpetual mourning', pg.22-23, Spring 1984, 22-23, 23 (illus.). Art investigator , 'Ideas and Themes' - Appropriation: Images Transformed', pg. 252-53, Melbourne, 1998, 252 (colour illus. ).